Our Lord holding the Burning Bush of Moses with the 10 Commandments. The Holy Ghost symbolised by the white bird. Finally the White Cross stands behind Our Lord. The world hangs at the precipice of major events that will change the direction of the world – Pray for Donald Trump and Vladimir Putin, as the elite of the Secret Societies wish to remove them. WILLIAM: Jesus came after Mass, standing in front of the Tabernacle – a White Cross behind Him. Then a burning bush appeared in front of Jesus. 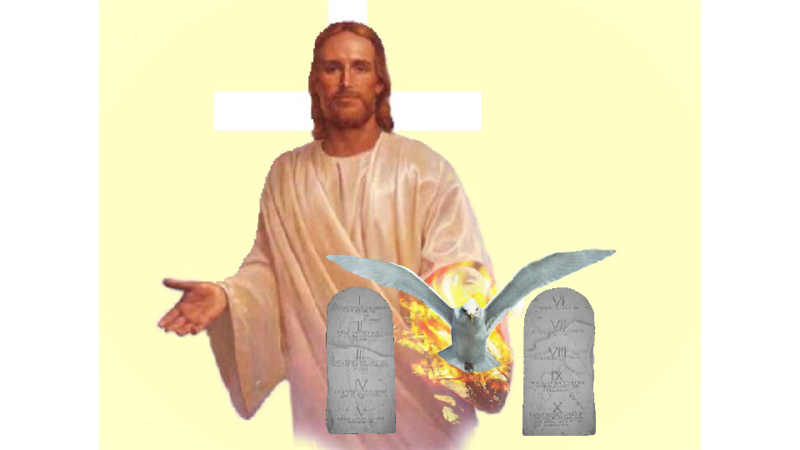 Our Lord held it and the Holy Spirit appeared in the bush as a Dove emanating much light; on either side of the Bush the Two Tablets of the Ten Commandments appeared. “Today We, the Trinity of Divine Love, send Our Holy Spirit to all of Our children, with many, many Graces. WILLIAM: Jesus then sends the Holy Spirit out.